yogi-comp has no other items for sale. I bought this life jacket after using the bulky ones for the last 30 years. I'll never go back. This one is well built, easy to charge, easy to wear and very comfortable in warm weather. I have no complaints at all except the fear that something will snag the manual inflate handle. I just tucked it up inside the sleeve. Problem solved. This is a great unit at a great price. This vest is functional and simple. But it's not nearly as comfortable as a similar self-inflating Mustang vest I bought previously. Slightly less expensive than the Mustang but I wouldn't buy it again. The part that hangs below your next in back is too bulky to be comfortable and the vest itself "crinkles" when you move. Much more comfortable then a standard PFD. I chose to us mine in the manual configuration only so it doesn't deploy until I chose. The nice thing is you can use it in automatic or manual. The auto configuration will deploy if it gets wet. In manual it will only deploy when you jersey the cord. Construction is good. It is easy to adjust and fits well. I did not test it yet, but if you watch the videos on Onyx Web site it appears to work well. Shipping took less than a week, ****** responded to my only question which was regarding whether the cylinder is included or not, and YES IT IS INCLUDED. I would definitely repeat buying from this ******. As for the PFD it self: - IMPORTANT: This PFD is US coast guard approved. There are other quality and good reviewed Inflatable PFD’s out there, that have different certifications, but are not US Coast guard approved. So keep this in mind. - I have not tried it on the water yet. But I did a lot of research online about different types of Inflatable PFD’s and their firing mechanism. If this is your 1ST inflatable PFD like me, it can be a bit confusing. -So here is the summary: There are two main types of inflatable PFD’s: Auto and Manual only. 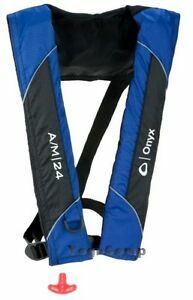 This ONYX PFD has an option to switch from Auto to Manual only mode. All inflatable PFD’s (including Auto) can be inflated by pulling the “jerk to inflate” handle and or by plowing air into the mouth piece. There are different types of firing mechanisms. This specific PFD gets inflated when the yellow bobbin gets wet then it triggers the firing pin which then pierce the CO2 cylinder causing the PFD to inflate. If you switch it to the “manual only” mode, it will not get inflated unless you pull the “jerk to inflate” handle. The manual only PFD’s are ideal for when you are worried about accidental firing/inflating. For my fishing and boating needs the automatic mode is recommended. If however, i wear this while skiing or with similar activities, I will have to switch it to manual only mode to prevent it from accidental inflating. - Important: The PFD gets delivered “unarmed”. You must arm it by installing the CO2 cylinder before putting it on. Doing so is easy enough, yet it’s a bit intimidating if it’s you first ever inflatable PFD and if you are trying to rely only on the text manual. Watch these YouTube manuals and you will find it so easy to setup and arm. 1) Rearming and repacking instruction video:youtu.be/Wy6aEZxJsnA 2) Switching from “Auto” to “Manual only” mode video:youtu.be/gMFGwHZyp1A - It’s also recommended to buy and carry a rearming kit which you need to rearm the PFD and to replace the CO2 cylinder each time you inflate the PFD. Make sure it’s the compatible rearming Kit “”Onyx A/M-24 Rearming Kit for Automatic/Manual Models ONYX KIT ITEM#K320 or part #1002295. Sold on walmart /ip/Onyx-A-M-24-Rearming-Kit-for-Automatic-Manual-Models/21439606 for $19. - Rearming kit should include: (1) 24-gram CO2 cylinder with a 1/2-inch thread (2) yellow water-soluble bobbin for automatic activation - this should not be older older than 3 years from the production date and some recommended that it should be replaced at least once a year (3) green indicator clip - Fit is nice and it’s very light weight. - Appearance is very basic but I don’t care much - It comes with a mesh carrying bag which is nice. I really like the size and feel of this life jacket. It's comfortable and I have no trouble fishing in it. Does it work as described? I don't know as I haven't fallen overboard yet, so I would say it works just fine.